That’s right. You will never find me inside a Wal-Mart or remotely close to the front doors. Why such a distaste you may ask? It can all be summed up with a borrowed and slightly changed line from John Mellencamp – “I was born into a small company. I grew up in a small company. I’ll die in a small company”. Don’t take my word for it. 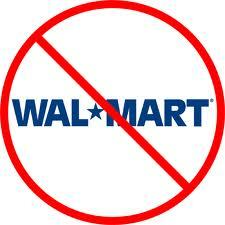 Check out the Wal-Mart Movie and see for yourself. Between the poor employee treatment, the supplier treatment, and the company destroying small town commercial districts, it’s not a pretty sight. You don’t see this type of behavior at most small companies. Am I weird for always preferring the small companies? Maybe so, but they are engrained in me. Both of my grandfathers, my dad, and several uncles have been small business owners. Now I can add myself to that list too. Do I always shop a local small business? No, of course not. But when given the chance of a large corporation or a small business, I will always choose the small business. Not only does it support someone living out their dream, but in most cases small business provide much better support and service. Let’s take a look at a couple of examples of this incredible service. Earlier this year, I bought a Sling and Small Pocket from Revelate Designs. Once I installed them on my bike, I ran into a couple of minor issues with my setup (H-bar handlebar and the size of my stuff sack). I emailed Eric at Revelate about these issues asking if anyone else had issues with the H-bar setup and asked if I could purchase some slightly longer straps for my stuff sack. Basically both these problems are alleviated with the Harness setup, longer main straps and dedicated male straps on top for the pocket, but that does not help you now. I’ll get something together for you that will work. A few days after Eric sent the email, I received a package in the mail with new straps and buckles. The new pieces worked perfectly. To top it off, Eric sent them free of charge even though I was willing to pay for them. With service like this on top of excellent products, I know exactly where my future bikepacking bags will be purchased from. You are exactly my size, so that makes it easy. I can cut apart a pair of old pants for a pattern. What material were you thinking? Do you think you would ever hear that from any medium or large company? Joe was going to tear apart a pair of his own pants to work on my crazy hairbrained idea! Again, with this type of service where someone goes way beyond what they have to do, I know where my future ultralight camping gear will come from. Other examples of small outdoor or cycling related companies delivering excellent service and excellent products – Kooka Bay sleeping pads, Goose Feet down socks, your local bike shop, Go Cycling Maui tours, your local coffee shop (you can’t have bikes without coffee, you can’t). Before you buy your next cycling or camping item, please consider purchasing from a local or small cottage manufacturer. You can search for “buy local” or “local first” to find companies in your city or area. You can also look at the 3/50 Project which focuses on spending $50 per month at independently owned businesses. On any given transaction, you may spend a few dollars more. However, you will be helping someone live out their dream and your support will be rewarded with incredible service.